As soon as winter weather starts giving way to fairer days, folks start itching to get any planned repairs, maintenance and renovations started. If you want to protect yourself from rogue and incompetent builders, take some advice from the Connecticut Better Business Bureau’s Howard Schwartz, who suggests a few time-honored procedures. Schwartz says it is essential to obtain multiple estimates before signing a contract. Study these estimates to learn what type of work is needed, the quality of materials they plan to use, how long the job may take, and its total cost. Check bbb.org to learn how long a contractor has been in business, contact information, verified customer reviews, complaint details, and how the business responded. Don’t be lured into signing a contract if someone offers a “today only” special. That is a sales tactic designed to get you to sign a contract or put down a deposit without giving you an opportunity to do your research. Obtain references from recent customers. You may want to speak with other property owners who had work done recently. Get everything in writing. All verbal promises should be contained in the contract, as well as a detailed description of the type of work needed, the quality of materials, how long the job may take, specifics about the deposit and payment schedule, and guarantees for the quality of work and materials. Pulling permits. 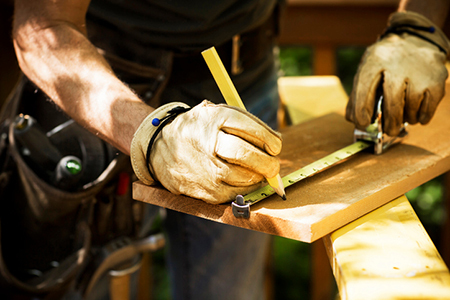 Contractors should obtain necessary permits as part of the job. If they’d rather not go for permits, it might be a warning sign. Compare apples to apples. Choosing a prospective contractor is simpler if you ask for quotes based on the number of hours needed and the same quality of materials. Finally, avoid putting down a large deposit. Schwartz says a typical schedule follows the “Rule of Thirds.” The first payment is made when signing the contract, the second when work begins, and the final payment when the job is finished and you are satisfied with the quality of work.